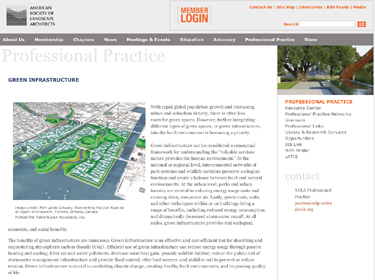 Green Infrastructure Digest began this past October. During this time, we have enjoyed bringing you information and news on green infrastructure and look forward to more in the New Year. The pace of posting has exceeded our expectations. We plan on keeping it up and bringing you helpful and interesting information each week. We appreciate you for taking the time to explore green infrastructure with us. We hope you will continue to read along and spread the word. If there are any specific topics or questions related to green infrastructure that you would like to see us address, please send us a comment or email. How much water can you harvest from fog? 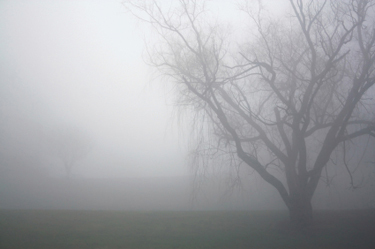 How much water can you harvest from fog? I hadn’t really thought about it until, I recently came across the work of FogQuest. FogQuest is a small Canadian all-volunteer organization founded in 2000 that constructs fog collection systems in areas where conventional sources such as wells, rivers and pipelines are not available. While not as applicable in most of the United States as a primary source of water harvesting (where we use approximately 100gals of water per person per day), the technology is still fascinating and has been effective in developing countries. The system is comprised of a series of screens made of polyethylene or polypropylene erected on poles in areas that frequently experience fog events. According to FogQuest’s website, a 40m2 system can on average collect approximately 200L per day (53 gallons). Like rain harvesting, there are days where no water is harvested, but on some days the system has been reported to collect up to 1000L (264 gallons). FogQuest estimates that a 40m2 system cost between $1,000-$1,500. They have a number of videos on their site that describe the system in more detail (Link to Videos). Andrew R. Parker, a zoologist at the University of Oxford, and Chris R. Lawrence, an investigator at QinetiQ, have developed another fog collection technology based on the Namib Desert Beetle’s wings. They have been able to mimic the beetle’s process for collecting water. It is an interesting application of biomimicry. 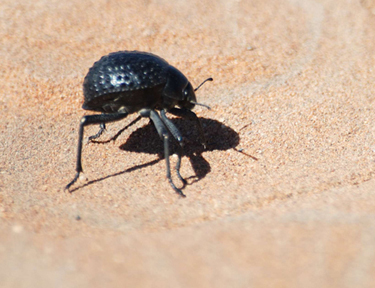 As the name suggest, the Namib Desert Beetle (see photo) lives in the Namib Desert where only a half-inch of rain falls annually. In response, the beetle has developed a unique survival mechanism. It is able to use its wings to collect water from fog that forms in the early morning and blows across the desert. The researchers discovered that this is accomplished through a series of small bumps on the surface of the beetle’s wings. When the beetle positions its body at 45 degrees the fog collects on its back and runs down the wings to its mouth. Here is a link to a website with more information about the process (link). In places with high winds, it is thought that this new fog collecting material may be more efficient than the open polyethylene mesh used by FogQuest because the water cannot be blown through it. Other applications being considered for the material include using it to reclaim water vapor from cooling towers to developing tents that would capture fog for drinking water. This material has even been envisioned to reduce or eliminate fog that can disrupt transportation systems (i.e. airports, roads). Comments : Comments Off on How much water can you harvest from fog? With a son who is a sophomore in college and a daughter as a high school senior, I have managed to spend a lot of time visiting college campuses over the past few years. One of the things that I have paid particular attention to (and seen an huge increase in during the past two years) is the focus on sustainability. My strong hunch is that schools are incorporating sustainable technologies because this generation of smart, college age youth demand it. Many college campuses now sport LEED certification on at least one building – my son’s dorm at the University of Richmond (Lakeview Hall) is LEED registered and undergoing certification. It is one of nine buildings at the University which is either certified, or in process of being certified as LEED with the USGBC. Locally, Vanderbilt University completed the LEED certified The Commons at Vanderbilt residential housing complex in 2008. As I have traversed the country and seen what must be dozens of (mostly) smaller liberal arts colleges, I have seen organic gardens and solar panels at Whitman College, windmills and biomass generators at Middlebury, local and organic foods at Skidmore, a unique “homestead” intentional environmental community at Denison, beautiful rain gardens at Emory and the list goes on. I also found a interesting resource online called the College Sustainability Report Card for 2010 (www.greenreportcard.org), This report card basically looks at environmental sustainability at over 325 colleges and universities in the United States and Canada based on 48 indicators used to evaluate performance within four categories. One of those categories is “green building”. It was heartening to see that 44% of the schools have had at least one LEED-certified green building or are in process of constructing one and a whopping three-quarters of all of the schools have adopted green building policies that specify minimum performance levels such as LEED certification for new construction. I was particularly interested in taking a closer look at some of the successes that I have witnessed at several of the schools that I have visited especially as they relate to green infrastructure. I found some additional information on Emory, Allegheny, Middlebury, University of Vermont and Macalester. As a part of Emory University in Atlanta’s overall commitment to sustainability (with over 1 million square feet in LEED certified buildings), Emory has incorporated many innovative water-conservation technologies.. Particularly impressive to me was their implementation of rainwater harvesting and condensate recovery, especially in light of the fact that Atlanta suffered an historic drought event in the summer of 2007. On Emory’s whole campus they have to date included 6 cisterns with a collective size of over 350,000 gallons for both toilet flushing and for irrigation as well as a condensate recovery technology for over 4 million gallons of water per year. In their new freshman residence complex including Ignatius Few Hall and Lettie Pate Whitehead Evans Hall, rainwater and condensate collection is diverted to an 89,000 gallon reservoir underground which can provide adequate volume to provide 2170 gallons per day needed to flush all toilets int eh buildings. The rainwater is collected form the roof, then filtered and slowed through a bioswale system outsde of the building and then into the below grade cistern. The condensate harvest provides a reliable source of water to supplement rainfall during those months from May through September. 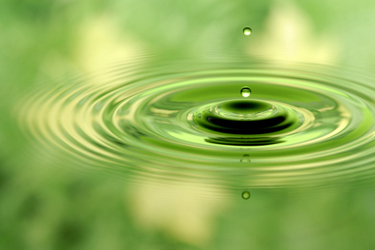 It is estimated that the condensate harvests is adding 300,000 gallons per year to the system. At the nearby Whitehead Biomedical Research Facility Building, completed in 2001, the engineers devised a system of piping condensate back into nearby cooling towers to use as make-up water. This system conserves water AND diverts 2.5 million (that’s 2,500,000) gallons a year from the sanitary sewer system. It seems to me that many, many schools are incorporating green roofs as that technology provides one of the most visible elements to show-off sustainable design. In every school we visited, if there WAS a green roof, it was highlighted on the student led campus tours. 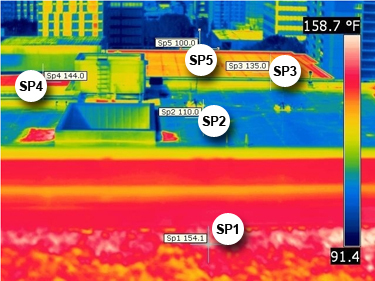 The green roof were touted for their well-documented benefits such as longer roof life, reduced cost of heating and cooling, stormwater runoff reduction and habitat. Allegheny College in Meadville, Pennsylvania impressed me with the well designed green roof on the Vukovich Center for Communication Arts. It is located within the topography of the campus site allowing for a fully accessible roof (entering the building at the green roof on the high side and entering on a lower level to the main campus commons or quad –type area. The roof includes extensive and semi-intensive depths and features lawn space as well as sedums and native grasses with an interesting incorporation of stones and cedar decking through the rooftop. University of Vermont, just on the edge of downtown Burlington, Vermont, recently completed the 186,000 s.f. Dudley H. Davis Center. The Center features a 19,000 s.f. green roof. Middlebury College, also in Vermont, provided a sloped green roof above the Atwater Dining Hall. 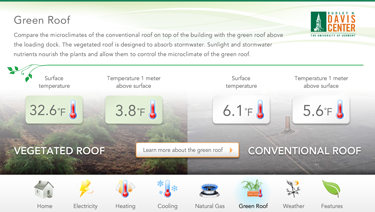 I was interested in seeing their notation that in addition to the traditional green roof benefits that I have seen listed in may locations, Middlebury includes improved acoustical insulation, noting that green roof systems can reduce airborne sound levels by 40 to 50 decibels. Macalester College in St. Paul, Minnesota impressed me, not in size but in determination. 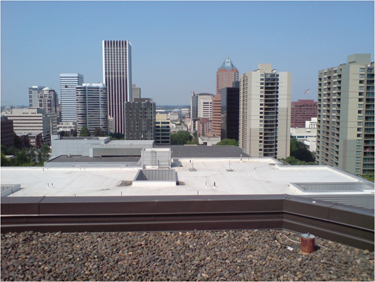 The two green roofs on campus were the result of student designs and even some student labor! The first green roof at Macalester was a 300 s.f. tray system installed above a walkway between tow residence halls and the newer 1350 s.f. green roof on Kagin Commons. I happened to be on campus the day the Kagin Commons green roof was unveiled. 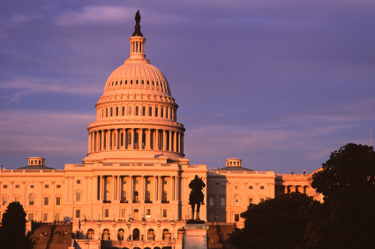 I believe the influence of these campuses and so many others will influence the bright minds of our next generation of decision makers and leaders.